The Five Organ Concertos are all based on works connected with Prince Johann Ernst of Saxe-Weimar. Three of the pieces are also linked with Vivaldi. 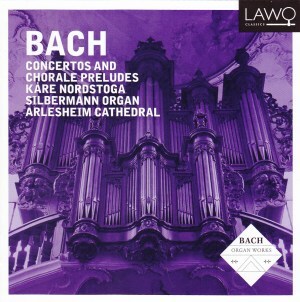 Bach was given the task of transcribing all five pieces for the organ to enable them to be performed more often. Bach put his own touch on all of them. The organ used to perform them here was originally built by Silbermann in 1761 but has had significant attention in the 1800s and 1900s. The main choruses remain those installed by Silbermann but there are several additions which make it more versatile for recent compositions. The first sound of the whole recording is dominated by the 16’ “Bombarde” which was added in 1961. This stop is used quite frequently and is really rather unpleasant. It doesn’t balance the rest of the sound at all and speaks very slowly so often sounds late. It totally ruins each movement in which it appears. This would be more forgivable it there was no alternative but there is an 8’ Trompette on the pedal as well and this is never heard in place of the 16’. The disappointment is deepened by the fact that the playing is very dynamic. The acoustics are generous but clarity of articulation never gets lost even in virtuosic runs. The balance of the rest of the instrument is excellent and the solo sound with orchestral effect is pleasing. A particular high-light is the first movement of the A minor concerto - no 16’ pedal reeds to interrupt the lovely sparkly mixture and the crisp and clean articulation. Disc 2 offers far move variety of registration due to the nature of the music. The first piece, the chorale partita on Sopra Sei Gegrusset Jesu Gutig showcases the very best of this instrument. The performance isn’t dissimilar to that by Hans Fagius which was re-released on CD in 2003 - and is also available to listen to on YouTube. The carefully judged tempo and placing of cadences is very like that of Fagius. Allein Gott In Der Hoh Sei Ehr BWV715has a return appearance of the 16’ pedal reed but the context is much more favourable. It is one sound in the texture rather than holding its own contrapuntal line and does work. By far the best track on either CD is Liebster Jesu Wir Sind Hier which displays the beautiful mutation stops and some very poised and emotional phrasing. Overall, this disc is a very good recording of a pretty good instrument. The playing is very fine in many places, however the registration choice isn’t always spot on.